Mobile Wash Stations (MWS) provide a cost-effective solution for cleaning electrolyte and other residue from lift truck batteries. Extend the life of batteries and reduce electrical problems in forklifts by using this essential maintenance equipment regularly. MWS models contain fork pockets for easily transporting the wash station to where workers need it. Dual anchor points allow the station to be secured during transport or permanently secured inside a facility. Washing forklift batteries is an essential part of warehouse maintenance. Simplify the process with BHS Mobile Wash Stations. Contact our sales team at 1.800.BHS.9500 to learn more about Battery Wash Equipment or to find a local dealer. 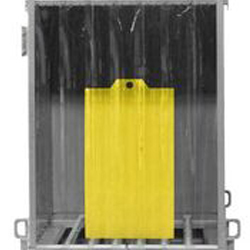 Portable wash station for Gantry Crane battery systems. Contains wastewater from battery washes for safe disposal. Turnkey solution for on-site battery washing. Washing forklift batteries is an important maintenance task, but it also creates legal and operational challenges. Wastewater generated by a battery wash is considered hazardouswaste under EPA regulations. For this reason, owners cannot simply let wash water run down the facility drain. Battery Wash Stations provide the solution. They contain all overspray, splashback, and wastewater within integrated collection trays. Some models even include tanks for clean and dirty water, giving service providers an all-in-one tool for washing batteries at the customer’s facility. in battery wash water. Like all Mobile Wash Stations, the MWS-72 collects all runoff for safe disposal, and includes fork pocketsfor transport via lift truck. The deck of the Stainless Steel Mobile Wash Station (MWS-47-SS) includes a combination of poly lead rollers and full-length friction strips, making it ideal for use with side-extraction forklift fleets. Steel panels contain wash water, while a splash curtain prevents splashback from escaping the unit. 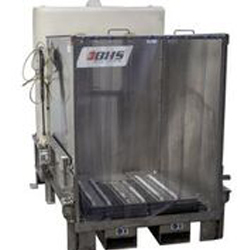 Dealers and battery service providers often choose the Stainless Steel Mobile Wash Station with Water Tanks (MWS-47-WT-SS). This model allows users to clean batteries on-site, even in the absence of plumbing. It incorporates two 120-gallon tanks and a Stainless Steel Mobile Wash Station into a single unit. All of these models are highly mobile, allowing users to position them near water sources or within battery rooms themselves. Click on any of the models above for details, specifications, and resources. 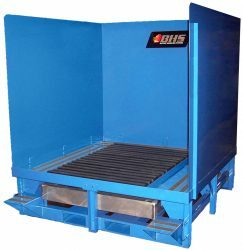 To learn more about Battery Wash Equipment and other battery-room solutions, call the BHS sales team at 1.800.BHS.9500.